Apollo MT4 will rely on the price structure to measure market volatility, thereby making decision to place limit order. Stoploss and Takeprofit are also measured based on market volatility. 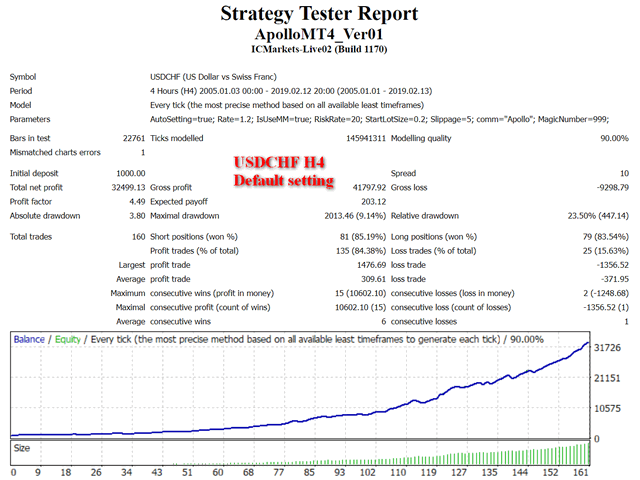 Please run this EA on USDCHF with H4 timeframe. ■ Risk Rate=20 - means 0.2 lot per 1000 unit balance. ■ Lot Size=0.2 - if ‘Is Using Money Management=false’, this lot size will be used.